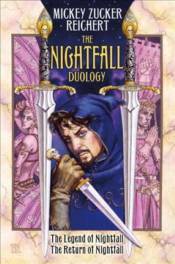 Legendary thief, lethal assassin, powerful sorcerer... this epic fantasy duology follows the adventures of the elusive man known as Nightfall as he struggles between his criminal past and his present obligation to protect the King. He has been known by countless names and terrifying deeds throughout the lands of mankind--thief, magic wielder, swordsman, assassin, adventurer. But chief among those names and perhaps the most dangerous of his personae is that of Nightfall, a man--or perhaps the legendary demon himself--gifted with unique powers which any sorcerer would kill to possess.